1) Inputting: It is the process of entering raw data, instructions and information into the computer. It is performed with the help of input devices. 2) Storing: The computer has primary memory and secondary storage to store data and instructions. It stores the data before sending it to CPU for processing and also stores the processed data before displaying it as output. 3) Processing: It is the process of converting the raw data into useful information. This process is performed by the CPU of the computer. It takes the raw data from storage, processes it and then sends back the processed data to storage. 4) Outputting: It is the process of presenting the processed data through output devices like monitor, printer and speakers. 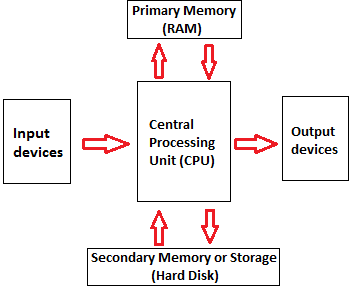 5) Controlling: This operation is performed by the control unit that is part of CPU. The control unit ensures that all basic operations are executed in a right manner and sequence.